The general aesthetic concept of Miami, Florida is that everything is bright and cheery. The sun shines all year round, and it’s a great place to vacation. Aside from the picturesque views of the Atlantic Ocean, even the scenery is different with its famous Art Deco designs with radiant-colored furniture to complement the whole vibe. Miami is literally a hot place and the interior design in a Miami build will often reflect that. Natural stone tile like Crema Marfil is one of the more popular tile selections for developers and contractors building in the Miami area. Stone tile keeps a cooler temperature, so it’s perfect for the warm and humid climate of Florida. You’ll notice that most builders who are interested in investing in a quality build will at the very least, install marble flooring. There are several different marble tiles to choose from, but Crema Marfil provides a neutral tone that appeals to most buyers. 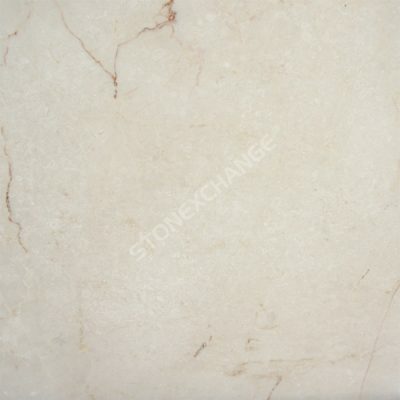 Crema Marfil is a Spanish marble that is not only popular in Miami, but all over the world. The reason why this natural stone is in such high demand is because of its versatility and appearance. In addition to flooring, Cream Marfil can be used for other types applications. It’s traditional lustrous finish paired with its inviting cream, beige, and ivory color tones create a luxurious ambiance to any design. Polished – This is the method that you commonly see. A polished finish has a smooth and shiny surface that reflects light and ultimately brightens the room. In a region like Miami, installing polished marble floors into a build will catch all of that beautiful sunlight, creating a bright and cheery space. Honed – The honed finished can be considered the opposite of the polished look. This finishing will not reflect as much light as a polished surface because it will have a plainer look, making it easy to blend in with other design elements. Bush-hammered – This type of finishing has a slightly rougher appearance than the slick polish. It has proven to be a good finishing for walls and high traffic areas on the floor, and even outdoors as it has enough texture to help prevent slip and falls. Brushed – This type of finishing is a cross between honed and bush-hammered, offering a more softer appearance in its textured surface. Here, you’ll still be able to identify the vein pattern while still maintaining a rustic type of appearance. Keep in mind that there is no such thing as a “bad” grade of Crema Marfil. Yet, because this stone has been organically created, different color variations will inevitably occur. As a result, mining Crema Marfil First is rare. Therefore, its limited availability makes it a premium quality. So, if you’re lucky enough to find Crema Marfil First, expect to pay for it. Otherwise, you can look at Crema Marfil Standard as your top choice. This grade has the least amount of veining. Veining is not a bad thing either. It is all a matter of preference. Some builders and developers prefer veining because it adds more dimensions to a space, while other prefer to have one solid color. This is where the Crema Marfil Commercial grade comes in to play. Because of its slightly higher veining, its price is more attractive to developers and builders, making it more affordable to stock. If you really want a lot of movement in your natural tone, there’s the Crema Marfil Classic that will have more veining and color variations of cream, ivory and beige throughout the slab. As a result, you can expect a less expensive price for this particular grade. Where Can I Purchase Crema Marfil Tile? Miami has plenty of sun and sand…there’s also a huge selection of marble distributors, but there’s really only one place you’ll want to get all of your Crema Marfil tile from, and that’s Nalboor Tiles. With Nalboor, you can order your Crema Marfil tile directly online without having to talk with a customer service associate—unless you want to. Our friendly and knowledgeable customer service staff is available to answer any questions you may have about Crema Marfil. Nalboor Tiles is your number one choice in the Miami area to stock your Crema Marfil marble inventory. You can reduce your unit cost of marble tile by simply purchasing your supply by the crate. Any orders that are less than a crate will have a surcharge. So the best way to save money for your next building project is to buy your Crema Marfil by the bulk. If you have any questions regarding what all of your wholesale buying options are, call Nalboor Tiles today at 1-305-501-4548 on get send us a quick question online today!